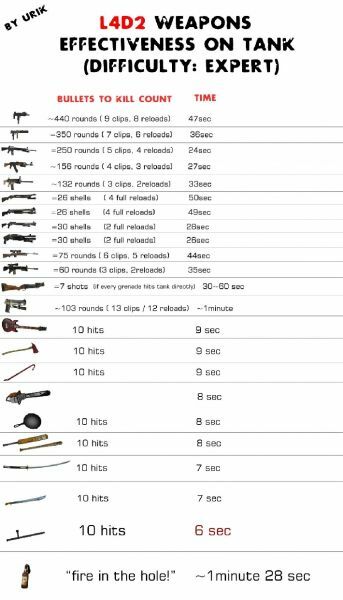 In pursuit of being the most efficient Left 4 Dead 2 co-op players on the internet, we present a chart created by Steam user "Urik" depicting the different weapons in the game versus the Tank. This is how long it will take you to bring down the Tank to carry your team, take notes. *This list was made using the PC version of Left 4 Dead 2, we have not verified that it works on the Xbox 360 version of the game. If you're feeling up to the challenge of testing this on the Xbox 360 version, let us know what you find out! Left for Dead 2 - 28 Billion Killed, Yet They Rise Again! Page created in 0.2296 seconds.